If it ain’t broke, don’t fix it. Such is the philosophy that Disney Crossy Road (Free) abides by. It pretty much lives up to its title, in that it’s Crossy Road (Free) but with Disney characters and themes. And it is a Disney geek’s dream. It would have been easy to just throw Disney characters into the classic Crossy Road level and call it a day, but it’s quite clear that Disney and Hipster Whale wouldn’t just do that. They threw in over a hundred characters at launch, with themes that don’t just change the graphics, but add little tweaks to the gameplay. And they added cool little notes that make this something every Disney fan needs to play. Plus, Crossy Road is still great. Just to get it out of the way, a year and a half since Crossy Road first came out, the game is still great. It’s still a peerless example of how to do a fun high score chaser on mobile. It has simple controls that work great for casual play, and gameplay that’s easy to learn but tough to do well at. 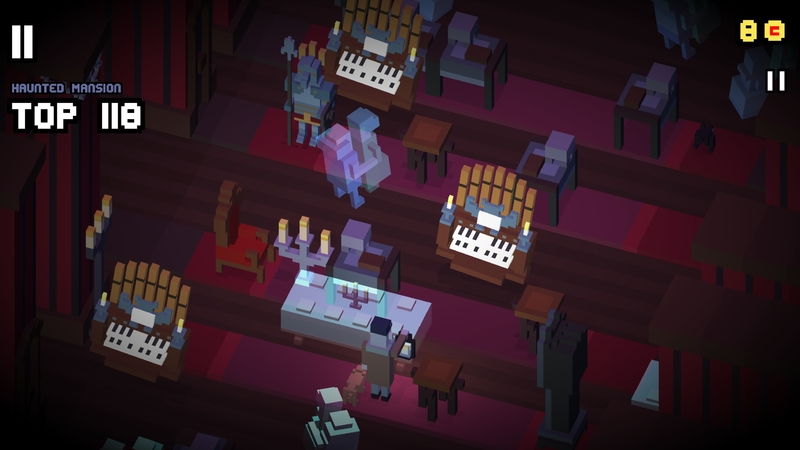 The production values are still top-notch, with an excellent voxel style. And the monetization is fair, striking that line between being something that’ll make a few bucks off of you, but still being friendly to free players. I can still play this game both for a minute and for an hour. 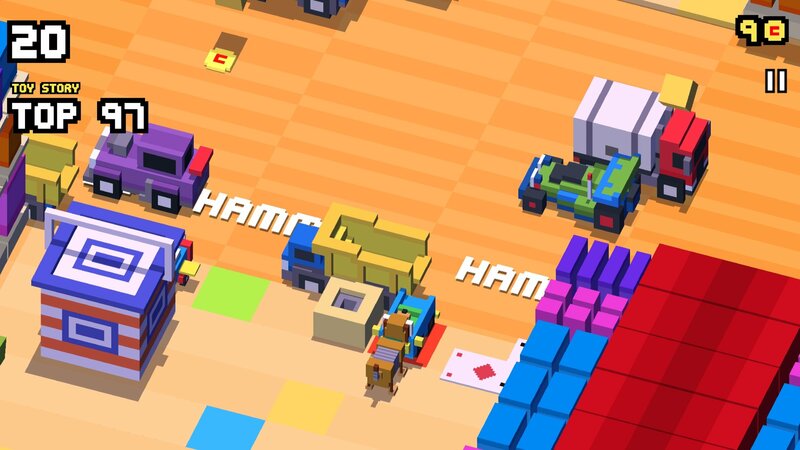 The Crossy Road formula doesn’t need to be messed with because it’s timeless. 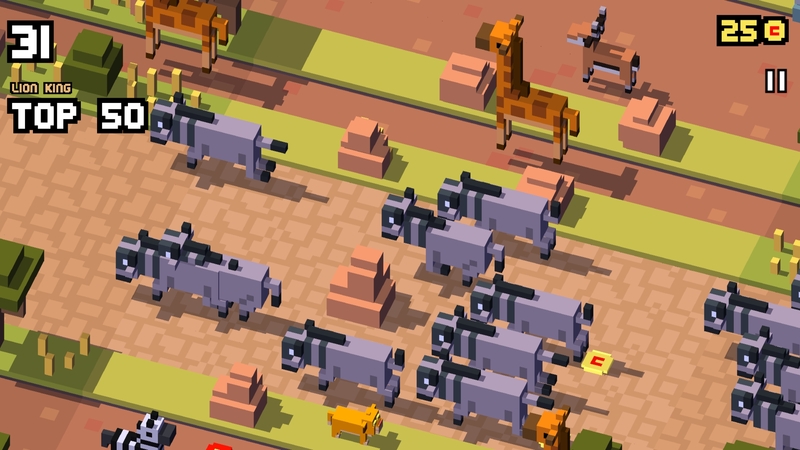 So, what Disney Crossy Road does is to apply that Disney magic to the Crossy Road formula. Everything is voxel-y, and the Mickey and Friends level is basically the Crossy Road theme but with black outlines around everything. The various characters come from a number of classic and modern Disney and Pixar franchises. You’ve got classics like The Lion King and Toy Story, along with new franchises like Inside Out and even the just-released Zootopia. Big Hero 6 makes an appearance, and that’s technically a Marvel franchise, but that’s the extent of Marvel here. No Star Wars either. I talked with some of the producers at Disney, and they said that they’re open to Marvel and Star Wars characters popping up at some point in the future, and you can expect new characters and themes to hit Disney Crossy Road. So, have hope, but there’s nothing concrete yet. Regardless, the themes alone are amazing. The Lion King level has a chiptune version of “I Just Can’t Wait to be King" as the level’s music. You’ll likely recognize the voiceovers and music from The Haunted Mansion level. Each theme even throws in some gameplay tricks. For example, the Wreck-It Ralph Sugar Rush level has candies that you can pick up for multipliers, helping you get much higher scores than most people would ever consider possible in a Crossy Road game. The Big Hero 8 level has jump pads to skip far ahead in the level. Haunted Mansion has you trying to relight candelabras to keep everything from going dark. Some of the themes do throw a wrench into the proceedings. For example, the Toy Story level has you dodging colored cubes coming from the top of the screen, which really forces you to approach things differently. Each theme winds up varying things more than just a new coat of paint, and it increases the replay value because you have what are different iterations on the game. What I’m kind of surprised by is that the game doesn’t really try to trim back on any of the visceralness that Crossy Road has. Like, Mickey’s getting hit by trucks here. And Simba might have to run through the stampede that killed Mufasa. It’s kinda messed up. But it is authentically Crossy Road. The only drawback to some of the unique level designs is that they make it harder to see what’s an obstacle and what’s a clear path. The original Crossy Road (and by extension, the Mickey and Friends level here) wound up doing a great job at making sure you knew where you were spatially at all times. Some of the more elaborate levels make that tricky, such as the Haunted Mansion level, particularly with its translucent nature. At least each level has its own high score leaderboard. The monetization is similar at its core to Crossy Road, where you earn coins for spins at the character machine, or you can just buy them outright. Where things vary is that characters have different rarities, and different prices: $0.99, $1.99, $2.99. In general, the more obscure characters are more expensive, so if you want to play as your favorites, you can do so pretty easily. Apparently, if you collect duplicates, then unlike Crossy Road where it was just tough tiddlywinks, there’s a system where you can collect your duplicates and get spins at higher-rarity characters. And if you want bonus coins, the pig is back. And of course, it’s Hamm from Toy Story, which is amazing. If you’ve played enough Crossy Road for one lifetime, I don’t know that the little tweaks in Disney Crossy Road will get you addicted again, because it is the same basic game. And honestly, I’ve got nothing against playing more Crossy Road, as Disney Crossy Road has taught me. But if you have any love in your heart for Disney, you owe it to yourself to play this game. There’s so much fun to be had from the various references and the tweaks to the formula that each theme brings to the table. 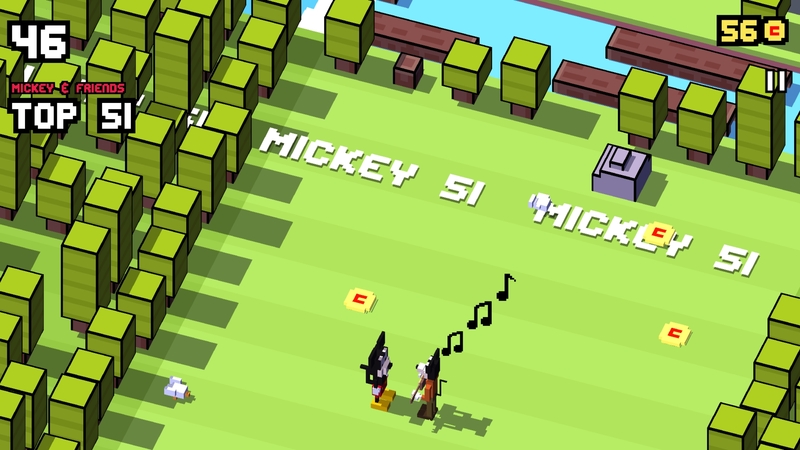 Disney Crossy Road delivers exactly what it says on the tin, and that’s great.